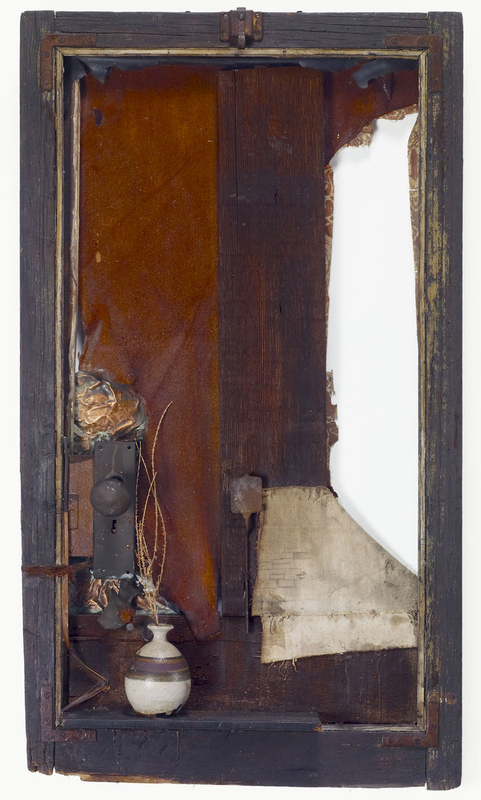 This assemblage includes a doorknob, leather, and other found objects set into a wooden frame. Many blacks who migrated to Southern California were attracted by the promise of sunshine and prosperity, only to be denied equal access to the region's resources. One factor that strongly influenced where African Americans made their homes in Los Angeles was the restrictive housing covenants that were in effect until the 1950s, which barred nonwhites from owning property in many areas. This ultimately led to housing shortages and overcrowding in black neighborhoods. "Home Is Where You Make It." Now Dig This! Art in Black Los Angeles, 1960–1980 Digital Archive. Los Angeles: Hammer Museum, 2016. https://hammer.ucla.edu/now-dig-this/art/home-is-where-you-make-it.